The Islamic Republic of Iran and the United States went at it, but it was not over Iran’s nuclear program or the US’s sanctions on Iran — it was over a gold medal at the Olympics. The US’s Jordan Burroughs beat Iran’s Sadegh Saeed Goudarzi at the final for the men’s 74-kilogram freestyle wrestling. When Burrough gets home, he’ll be cut a check for $250,000 from USA Wrestling. Goudarzi is not going home empty-handed either, not only is he the silver medal will, but he’ll be getting some 100 gold coins from the Iranian government. The final match had many on edge; not only was it a matter of pride, but a showing of dominance one country had over the other during such a politically turbulent time. This was a particularly important moment for Iranians as they battle sanctions and an impending war over it’s controversial nuclear program. Despite this loss, the London Olympics have been a successful time for Iranians alike as they have won 10 medals to date: 4 gold, 5 silver, and 1 bronze. Iran is currently ranked 14th in the top 20, the only Middle Eastern country to make it with its ten medals. The last time Iran and the United States played against each other was at the 2008 Beijing Olympics in a heated basketball match, the US winning 88-55. Historically, the most politically-charged game was the match at the 1998 World Cup in France, Iran won 2-1. The game won the 1998 Fair Play award despite hard-liners in the Iranian regime warning against the exchanging of team shirts and shaking hands that went deaf in players ears. Gifts were even exchanged. Prior to that in the 1990s, Iran and the US had wrestling match exchanges, but none were as significant as the match between Goudarzi and Burroughs. In an article by Saeed Kamali Dehghan for the Guardian, he said the Olympics are “lifting the spirits of a nation gripped by sorrow and anxiety. “Despite all the pressure, there’s at least something positive out there to talk about and that’s the Olympics,” Reza said (Person being interviewed).” Dehghan is right and this is why we must be reminded that this is about the people, not regimes. Sanctions are hurting the Iranian people. Regardless of what different analysts or policy makers are telling you, there are a great number of people who are suffering and they are at the bottom of the class system, invisible to the naked eye. They do not roam the main streets of Tehran, Mashhad, or Esfahan — they are too busy trying to make ends meet for their families. Journalists like the New York Times’ Nicholas Kristof — who took a fancy tour of Iran while being followed by government officials (Probably knowingly) — did not get to see the bulk of the situation Iran is facing. As someone on the ground in Iran, let it be a reminder that these sanctions are not affecting the system, but the people whom are a part of it. 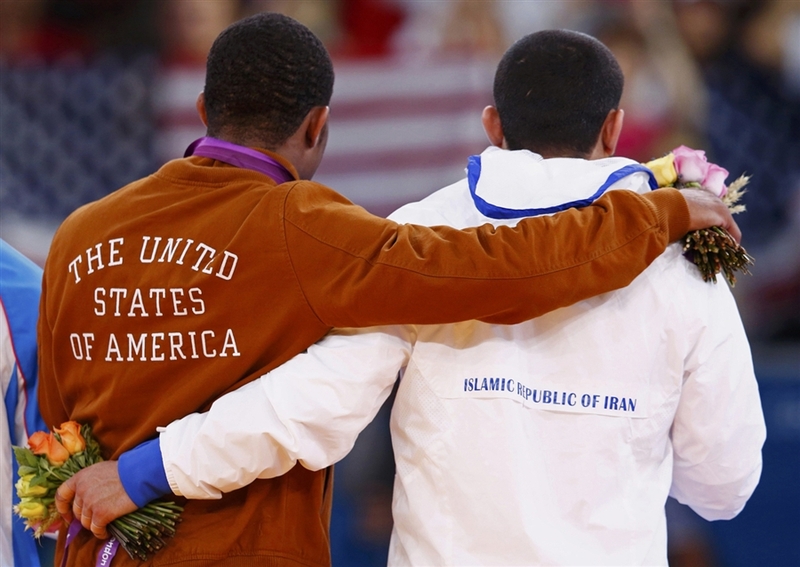 If there’s something the United States and Iran can learn from this important Olympic match is that they have the potential to get along again. It mainly demonstrated what the two countries could potentially share with one another: mutual respect, honor, and friendship. All it takes now is the ability to outmaneuver the other political forces stopping this possibility. « In The Garden of Mullahs: ‘Apple,’ A Forbidden Fruit?